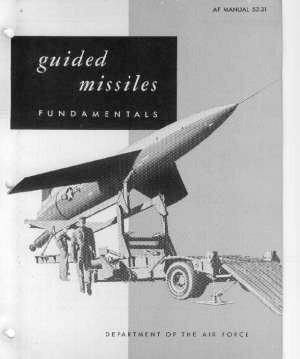 The student TAC missileer's bible, manual AFM 52-31 from SET school at Lowry AFB, Colorado. A prototype TM-61 (YB-61) Matador graces the cover. The missile knows where it is at all times. It knows this because it knows where it isn't! By subtracting where it is from where it isn't, or where it isn't from where it is ( whichever is greater), it obtains a difference or deviation. The guidance system uses deviations to generate corrective commands to drive the missile from a position where it wasn't to where it now is. Consequently, the position where it was is now the position where it isn't. In the event that the position where it is now is not the position where it wasn't, the system has acquired a variation (variations are caused by external factors, and the discussions of these factors is not considered to be within the scope of this report). 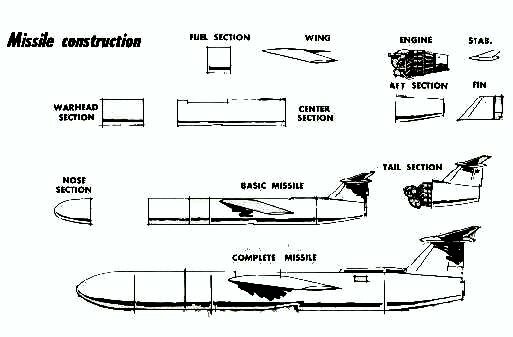 The variation being the difference between where the missile is and where the missile wasn't. If variations are considered to be a significant factor, it, too, may be corrected for by the use of another system. However, for this to take place, the missile must know where it was, also. "I have hung on to this for years, ever since I came across it in 1959-60. You may find it appropriate to post somewhere. Mike Osborne, from Missouri. Classmate in 1958 in 1958 and current neighbor of Garland Frances. Right turn! Right spoilers up causes loss of lift on that wing surface, which drops that wing into a bank. 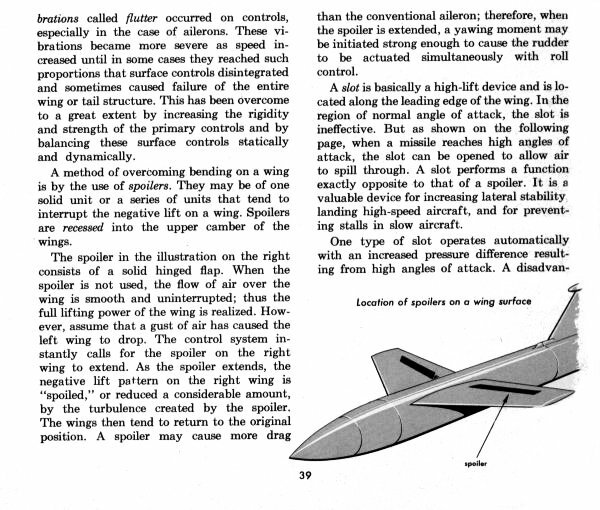 It also causes the nose to drop, causing the Variable Incidence Horizontal Stabilizer to crank trailing edge up and bring the missile nose up level and the turn is accomplished. Left spoilers up returns the missile to level flight. The spoiler extension was mutually exclusive, either one side up or the other, but not both. There are monument-mounted Matadors and Maces that have both sides up. In that case, the control links are disconnected from the yoke. 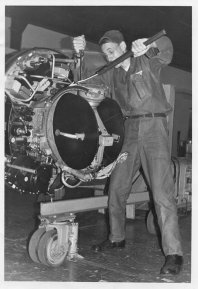 Having ones hands or fingers in the spoiler slot during systems checkout when the hydraulic system was at the full 1500 PSI was not a smart idea. 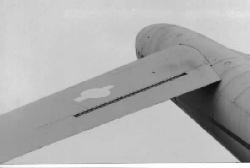 Neither was standing on the fuselage near the Variable Incidence Horizontal Stabilizer (VIHS) during test. 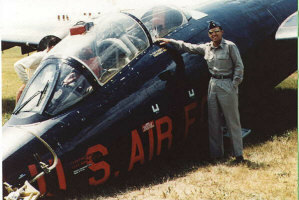 "This plane was flown by a civilian crew from Goodyear Aircraft out of Litchfield Park, Arizona. 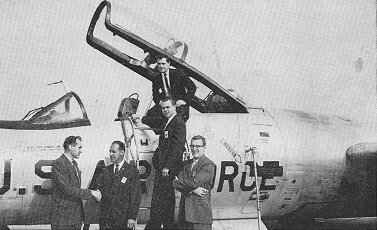 It flew out of Sembach for about 6 months from January 1960. After that, the crew returned to the states and the plane sat unused. I don't know what finally happened to it. It's official designation was a JT-33 and the serial number was 52-9375. There was a sister ship made also that stayed in Tucson, it's serial number was 52-8919.
had, before or since. 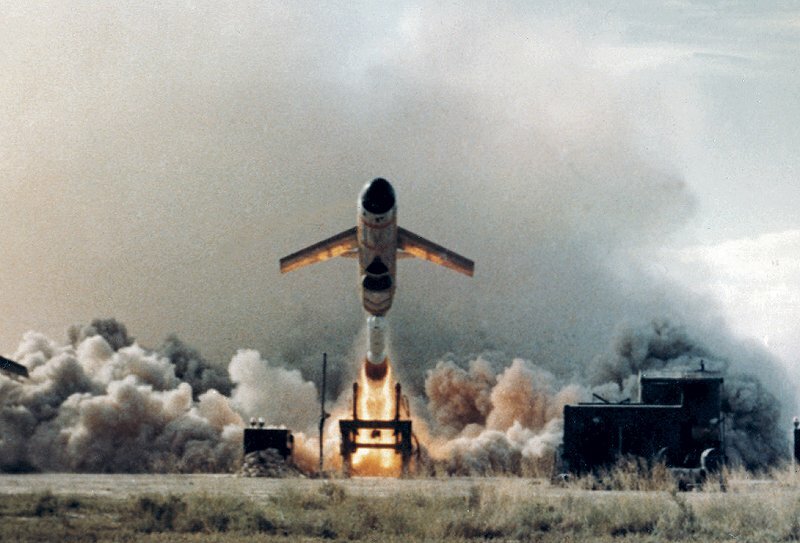 It was all very low level and on a heading of due east toward the east German border." This image is courtesy of John Donovan, the crew chief of this aircraft. John's feet are seen just below the other side of the aircraft. 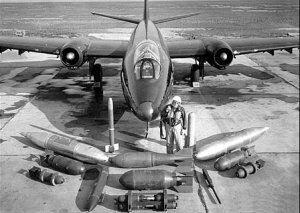 Martin B-57 SN52-1562, shown here in a Martin Co. armaments photograph, was later converted to MSB-57B with TM-76A Mace nose. 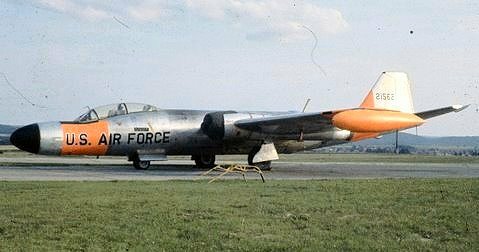 B-57 s/n 52-1565, after a "hard landing" at Dover on a flight from Warner Robins, required extensive airframe rebuild. 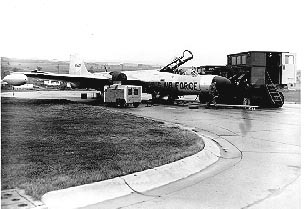 "The aircraft 52-1565 was lost to the 38th Bomb Wing but later repaired. I saw it in North Africa as a "Shanicle" airplane. 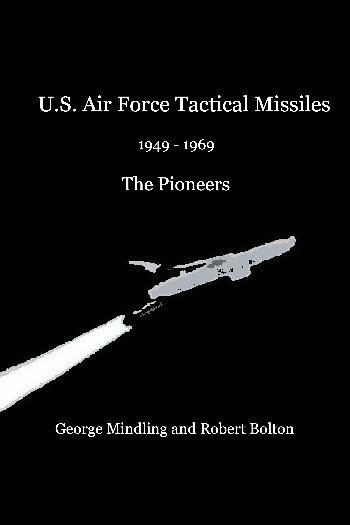 They had attached a Mace nose to it and it's job was to fly the missile tracks as a missile for test purposes, I suppose." 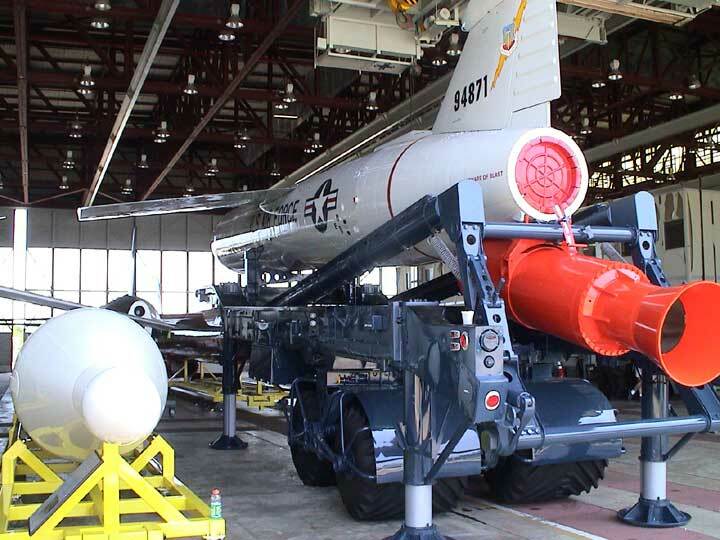 Martin Marietta converted B-57B S/N 52-1539 and S/N 52-1562 to adapt the Mace "A" nose section to test and checkout the TM-76A guidance system. Both MSB-57s were assigned to the 38th TMW at Sembach. The two aircraft were fitted with Mace nose sections incorporating the Automatic Terrain Recognition And Navigation - ATRAN guidance system. 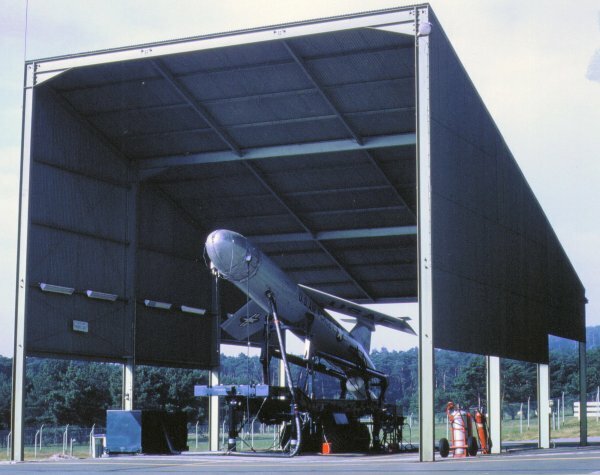 The ATRAN system employed a terrain-matching radar guidance system in which the return from a radar scanning antenna was matched with serial frames of 35mm terrain "maps" carried on board the missile. 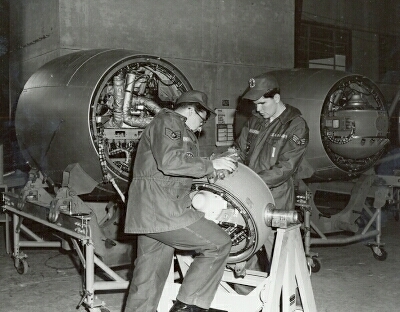 "MARTIN-BUILT B57 recently used in research and development tests of a guidance system, serves as back drop at Strawberry Point, Baltimore division for, from left, Don Schacht, AC Spark Plug Co.; Raymond Vogel, site manager, flight Test Support; Tom McDonald, MACE systems group leader, Installation & Test, Electronic Systems and Products; in back, top, Don McCusker, manager, simulated MACE program; on step, John Miller, AC Spark Plug Co."
The B-57 was also used as a flying test bed for the inertial guidance system used in the TM-76B, but the Martin aircraft was not assigned to a US Air Force tactical missile unit. 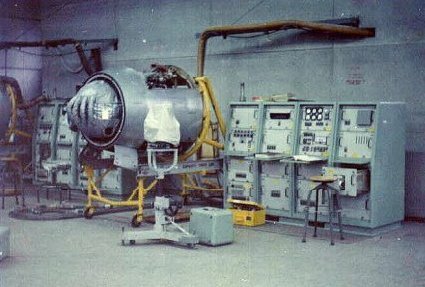 A Mace B nose section sits ready for checkout at a Guidance Systems Checkout (GSC) station in the MSA area at Bitburg. The theodolite, called an Azimuth Alignment Unit, or simply the AAU, was used to reference the IG platform for checkout. The sound proof air conditioner rooms, where the flex hose enters the checkout area, had to be built after it was determined permanent hearing loss would occur if anyone was exposed to the incredible noise levels for an extended period of time, even with the mandatory ear plugs. 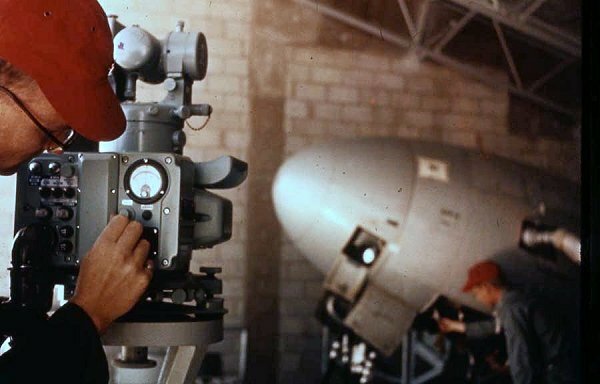 Students of the 4504th Student Squadron at the TAC Missile Combat Training School in Orlando AFB, reference an inertial guidance system on a TM-76B (CGM-13B) in a school launch bay using the Azimuth Alignment Unit, a K&E Theodolite. 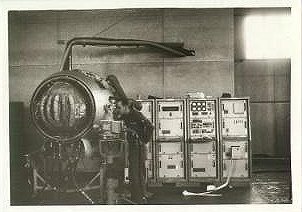 In this USAF photo, S/Sgt Keith Hover and an unidentified A1C dismantle an AC Achiever guidance system in May, 1969, at Bitburg after CGM-13B shutdown. 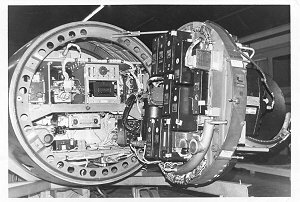 The size of these massive gimbals and the complexity of the heating and cooling system are readily viewable in these photos of disassembly. "The video slide show tells most of the tale. It is now in a temporary storage area at the Air Force base at the Cape awaiting their new display hangar to be completed." Thanks to Bob Bolton (olliesnapper@gmail.com) for the original Mace spoiler photos.